Most lawnmowers have height adjustments to use when mowing your lawn. Manicured lawns tend to be cut shorter although the height of your grass can affect its health. This is a guide about choosing the best lawnmower height setting. Cutting your lawn at the right mowing height is the single most important thing you can do to keep your lawn healthy. Mowing at the correct height reduces weed problems, contributes to a healthy root system, increases resistance to drought, insects, and diseases, and helps prevent run-off of soil, fertilizers, chemicals, and pollutants. When choosing the best lawnmower height setting, the first thing you need to take into account is what type of grass you are growing. Grass species have a range of recommended mowing heights, and the chart above is only meant to be a guideline. Lawn experts recommend staying toward the upper end of the ranges given-especially during stressful conditions such as hot weather or drought, or if your lawn is growing in the shade. In cooler weather and under ideal conditions, you can afford to cut the grass a little lower. If you are unsure what type of grass species you have growing, cutting it at a height of 2 1/2 to 3 inches will work for the majority of grass varieties. 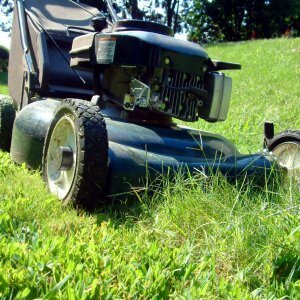 For a healthy lawn, never cut more than one-third of the grass blade during any one mowing session. If your lawn grows too long, due to wet weather or a busy schedule, increase the cutting height of your mower to the highest possible setting before you mow. Then move the cutting height back to your normal range and cut the lawn again four or five days later. If you stick to the 1/3 rule, you should never have to worry about bagging the clippings, because the grass clippings will always be short enough to filter down to the soil's surface to decompose and recycle nutrients back into your lawn. Mowing your lawn at the correct height keeps the growth thick and vigorous, and reduces the growth of broad-leafed weeds-according to some studies, by as much as 50 to 80%. To set the mowing height on a rotary lawn mower, adjust the blade height levers at each of the lawnmower's wheels. Place the mower on a flat surface like a driveway or sidewalk and push each lever to the setting recommended above. If height settings are not indicated on your lawn mower, test the adjustment by mowing a small area of grass, then use a ruler to measure from the soil to the tip of the blade. 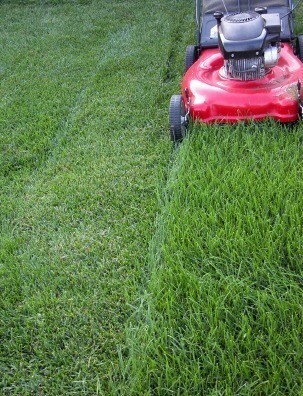 Remember to only mow when it's dry and to keep the lawnmower's blades sharp. I've looked at lawn mower videos for adjusting the height. The notches close to the ground, is that the shortest cut for the grass and as you move up higher, is that higher cuts of grass? I want the highest cut at the moment. As I am using a neighbour's mower and it is too low and my wheels are loose on my own mower and the adjustments for height are not working at the moment. I am pretty sure the notch closest to the ground is the shortest, but I want to make sure. Yes. This moves the deck to the ground. If you want to go higher, you need to go to the notch furthest away from the wheel. I have read that it is best for your grass to set the lawnmower at it's highest setting. I have also heard just the opposite, that the lowest setting is best. So, I usually just keep mine in the middle. Is better have it higher or lower? It is best to use a high setting. There are two factors you should keep in mind. One, the type of grass and two, the shape of your yard. You are trying not to kill the grass or create bald spots. The highest setting will prevent both of these things from happening. I think it is safe to say that you did not kill any of the grass with your current setting. I would go with it. It depends on your grass type, and the water available-a lot of people like to keep their grass a little longer to encourage strong, drought resistant roots-a grass root is only as long as it's blade. Some grasses are more drought resistant than others, and some have cultural requirements that dictate the height-the best thing is to know what grass you have. If it's a mix of different grasses, just mow it to a height slightly higher than your neighbours, lol-your lawn will retain colour better but won't attract disapproving looks or a letter from the HOA.